What is an Ear Cricket? An Ear Cricket is essentially an ear cuff. It's decorative and funky but doesn't hurt or pinch while being worn. Ear Crickets are custom fit to surround your ear to look beautiful and feel like nothing is there! Ear Crickets are made with 18 gauge Sterling Silver wire - unless otherwise requested. How do Ear Crickets work? Ear crickets lie on the bridge or your ear (not the cartilage) and, when fitted correctly, should feel like nothing is there at all! 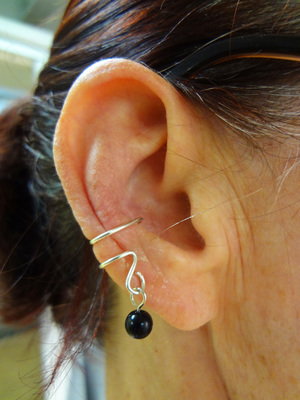 Ear crickets can be worn alone or with preexisting piercings for a more complex look. 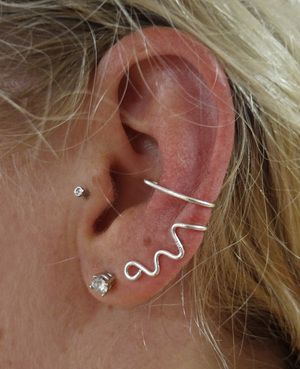 What is the difference between a Cuff and a Squiggle? 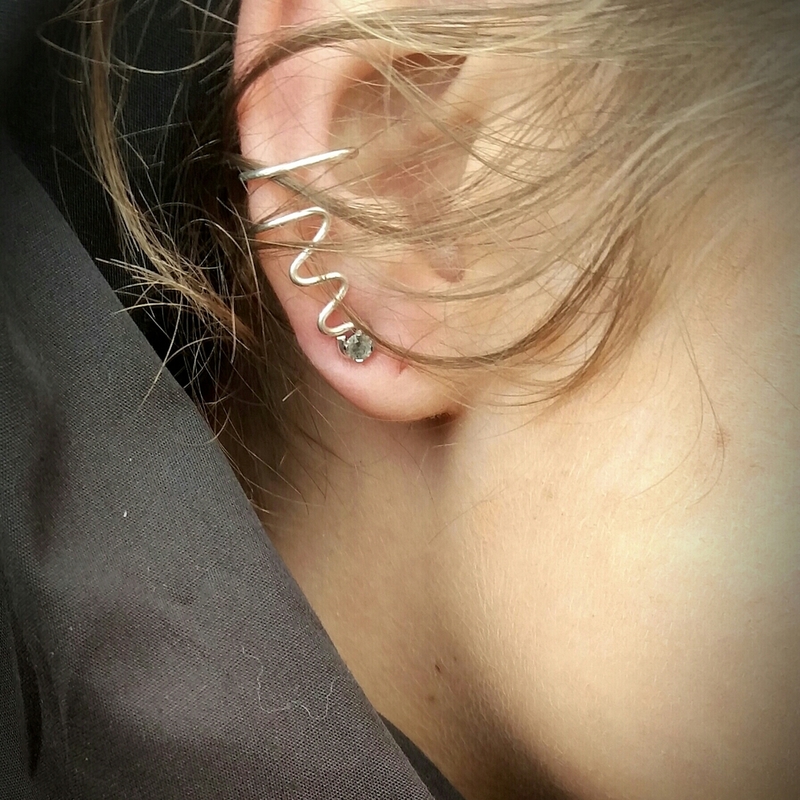 Ear Cuffs are the smallest type of ear cricket , resembling a classic cuff. Ear Squiggles arelonger and generally have a hole at the bottom. This hole is awesome because it allows an earring (stud/hook) to be put through the hole to secure the cricket, meaning it will not detach until you decide to take it off! With this feature, the wearer can be active without having to worry about losing anything. 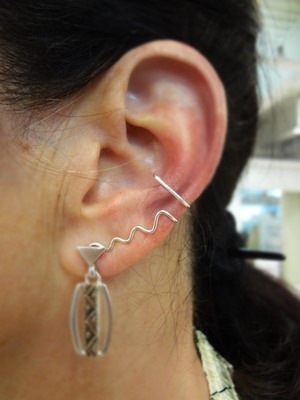 Different from an Ear Cuff, upon ordering a Ear Squiggle, the length must be selected. A long Ear Squiggle will have the hole of the cricket reaching the middle of your ear lobe. A short Ear Squiggle will put the hole of the cricket in a place where a SECOND piercing would be. Examples of these can be found in the photos above. Can anyone wear Ear Crickets? Everyone's ears are unique and beautiful! They do not require that an ear be pierced and welcome a wearer of any gender, any age. Ear Crickets prefer to be custom fit so they aren't able to hop away without you knowing! To reduce the amount of discomfort and further ensure the best fit for your ear, we recommend an in-person consultation. If not local, please contact us for suggestions and we will make it work! If you have further questions or want to customize, please contact us!